This is the feeling of uncomfortable tension which comes from holding two conflicting thoughts in the mind at the same time. 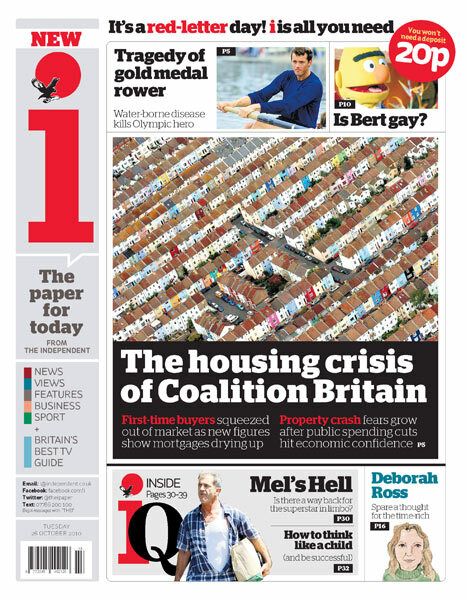 The first edition of i - the new national daily launched by The Independent - leads on housing, saying first-time buyers are being squeezed out of the market and there are fears of another property crash. i diots buy this newspaper. ..sersiously, who buys news these days? Isn't creating a new dead tree press newspaper just an example of stupid bloody mindedness in the face of all sane evidence that the act buying a newspaper is dying out? You can if you study the stages of socialist change.